People on chinese forum say this looks bad... do you think so? no, hyp, it looks delicious and you should stop worrying about what no-nothing internet users think otherwise. Well, it doesn't look like Chinese food. 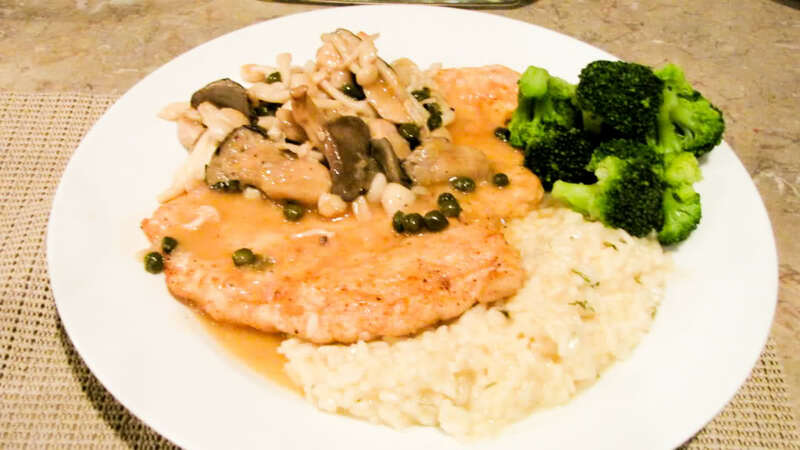 It looks fine for a chicken scallopine and risotto. I think it looks fine. I think the problem is you are posting to a Chinese Cooking forum but you are not cooking Chinese and I am guessing they are looking for things to be photographed and presented in a certain way. It looks fine to me. But why is the chicken orange? Whether or not people say it looks bad, or don't say anything at all, shouldn't really matter if you are happy with it. I need some clarification. Is the Chinese forum a Chinese food forum or a different kind of forum? They may be trying to prove that a white man can't cook. Hate to say it that way but I get some of that on my YT videos. Back to the original question which one would you prefer to eat yours or this one. Looks to me that you are shooting in low light. Also read your cameras manual and look for a food setting.